The BioRad Gene Pulser Xcell Electroporation System is a flexible, modular electroporation system that can transfect all cell types, from primary and stem cells to bacteria and yeast. Electroporation is the most efficient method available for gene expression analysis for the widest range and variety of cell types. This easy to program electroporation system comes with a convenient preset protocol library, including most bacterial and mammalian cell types, immortal and primary cells. This electroporator has the capacity to store and recall parameters in up to 100 experiments to aid in troubleshooting, while pulse trac circuitry and arc protection features ensure reproducibility and sample protection. The BioRad Gene Pulser Xcell is also capable of reading eukaryotic and prokaryotic cells. The total Electroporation system can use either exponential, or square wave pulses needed for either karyotic cell types. The PC Module contains resistors required for high voltage electroporation analysis. The system uses BioRad's patented PulseTrac circuitry, delivering the higher reproducible results. The Gene Pulser Xcell delivers up to 3000V allowing the flexibility of chaning research in this modular design. 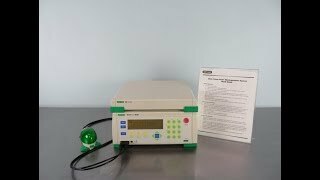 This Electroporation system is user friendly with built-in presets, but also allows the user to manually program their process as well. This BioRad Gene Pulser Xcell Electroporation System has been thorouhgly tested and performed beautifully. All of our lab equipment comes backed with our standard warranty. Should you have any questions, please don't hesitate to contact us.